Once you have decided to renovate your home to add more functional living spaces, it is important to choose a contractor who has experience working with the type of renovation you want. You need a company that is reliable enough to handle your projects with minimal supervision and that can provide an excellent service using its knowledge on the various aspects of home additions. You also need a contractor that understands just how special and important a home is. Fortunately, Four Seasons Landscape Management can offer you all these and more. 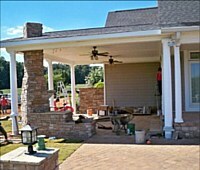 We can work on various additions to your home, be it indoors or outdoors. We can add functional rooms, like attics, playrooms, bedrooms, and more, without compromising the existing rooms and spaces inside your house. As for outdoor additions, we can help you extend your living space while increasing the appeal and value of your whole property. If you have no idea on how to make it happen, we can provide you with various designs for home additions based on your preferences, needs, and the current look and setup of your home. Our creative designers would love to provide you with functional, practical, but still highly captivating designs for both interior and exterior additions. If you have a design idea, tell us and we will create a plan for it and make it a reality. Once a plan or design for home additions is agreed upon, you don't need to look farther for someone to build it for you. We have a team of experienced and knowledgeable engineers and builders who can take care of the construction for you. With minimal supervision, we make use of effective and efficient methods and techniques for faster completion, without compromising the durability and quality of structures. Not only do we provide design and construction services for home additions, we also provide services for improvement or renovation. Whether it is just for one room or for several areas within and outside of your home, we can do it for you. First, we discuss the project with you, noting down the actual areas that need renovation, what you want them to look like and do after completion, and what type of materials will be used, based on compatibility with existing structures and your preferences. Four Seasons Landscape Management is more than just a landscaping company in Georgia. We care about your properties so we ensure that both your outdoors and indoors are well taken care of. For a free estimate on home additions, do not hesitate to give us a call.